A Heritage scrapbook layout is like an 'Introduction' service you provide to your descendants - introducing them to your ancestors! In fact, creating a heritage layout is a privilege. This layout centres around my late grandfather, where I've picked three momentous occasions in his life - serving in World War One, Marriage, and serving in World War Two (in the real 'Dad's Army') There is a pleasing symmetry with using three photos which I can't really explain. I used a little 'word-play' to link the photos and - remembering his humour - I'm sure he would have approved. Word play in your journaling, if not overdone, can bring amusement to descendants you'll never even meet! Old photos in black and white or sepia benefit from a conservative colour palette. Your grandparents might not sit well against neon colours and funky page accents! You'd be better off using Victorian scrapbook paper or just anything dignified and slightly sombre. Every time I think about making a layout I um and ah for ages, not knowing how to start it. I might have some great photos, maybe even some great embellishments but I can't get a handle on the 'big picture' - literally. I am therefore hugely grateful to Gladys Potter's 'Ultimate Scrapbooking Resource Guide' for giving me a bit more confidence and belief. If you want to take the whole area of heritage and genealogy a bit further, - whether it's selling products to create a family heritage or family history album, as well as charts, how-to books, scrapbooking products and supplies, and helpful information and links to start your family tree research - you could always visit this Online Genealogy store . For this heritage scrapbook layout I used Clover's 'Classic Heritage' Kit, which gave me that old-fashioned 'wallpaper', plus the 'mirror frame'. I put the tied ribbon centrepiece there to suggest a military medal and my 'Craftee Cutter' provided the wavy edges on the beige vellum. 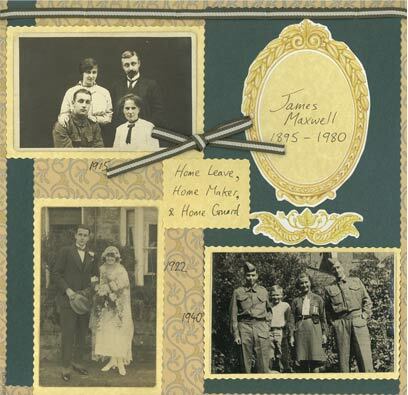 You could create a generations scrapbook album to show off your past and present family to your future one! You could include some recipe scrapbooking, featuring recipes handed down through the family by word of mouth. A photo of the finished dish beside the written recipe might work a treat! Photographs of your ancestors at work can be great for your heritage scrapbook layout. You could then surf the web for some background on what that job entailed - and then base your journaling on that. There are some great places to go online to pick up good Heritage stash. I used a page kit, but you can put together a sober, reverent layout just by choosing colours and designs to match the mood of your photos. I have an excellent resource now for layout ideas - which is a book by Jen Gormley, crammed full of sketched templates for page layouts. I wish I'd found it before I made most of my layouts, but for next time I'll certainly use one of Jen's sketches - especially when I don't have any inspiration (ie. quite often!). There's a great sample on this page of how her templates can be 'brought to life'. I've personally remained 'analogue' to this point. It's taken long enough to use my craft knife without cutting myself. However if you're after digital scrapbook supply on the 'heritage front' - don't be put off just because I'm still in a 20th century timewarp!